Words are one thing, but to really appreciate Jupiter, we’re going to want to see pictures. This is a picture of Jupiter captured by NASA’s Cassini spacecraft, on its way to its final destination: Saturn. The black spot is a shadow cast by Jupiter’s moon Europa. Cassini was never able to capture this detailed a resolution image of Jupiter because the planet was too big to fit into its camera field of view. Instead, the spacecraft took 4 separate images which were then combined together on computer. This Jupiter pic is a montage of the planet and its moon Io, captured by NASA’s New Horizons spacecraft on its way out to Pluto. The two objects were never actually lined up like this, instead, the separate images were combined together on computer. Although this picture of Jupiter looks like it was taken by a spacecraft, it was actually taken by the Hubble Space Telescope, currently in orbit around the Earth. The photograph of Jupiter was taken to show the Great Red Spot, which has been decreasing in size over the last century. This image of Jupiter was captured by NASA’s Galileo spacecraft. As Galileo was orbiting Jupiter, it didn’t take many large images of the planet. This photograph is a mosaic of many images stitched together, showing the boundary between a zone and a belt on Jupiter. 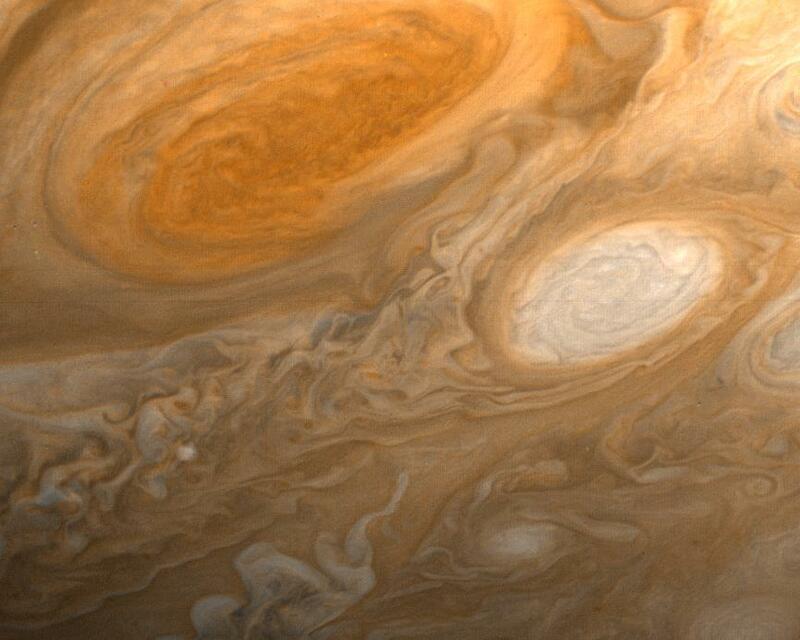 This is one of the most famous pictures of Jupiter and its Great Red Spot. This was captured by NASA’s Voyager 1 spacecraft as it was speeding past the giant planet. Did you enjoy these images of Jupiter? There are many more on Universe Today. For example, this is a picture of Jupiter’s south pole captured by Cassini. And here’s Jupiter seen from Saturn. Probably the best resource for pictures of Jupiter is from NASA’s Planetary Photojournal. You can access it here.